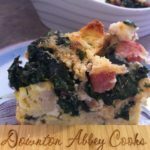 This is a great dish to make when you have company staying over on the holidays and you want to spend time with them and not so much in the kitchen. Kitchen parties are great but it can be hard to concentrate on both cooking and conversation so early in the morning. Just throw it in the oven. I typically serve with a spicy tomato sauce. Mix together eggs, milk and spices. Set aside. Heat olive oil over medium-high heat, then throw in your green leafy vegetable Cook for 2 minutes, or until slightly wilted. Remove from heat and set aside. Grease a large casserole dish (9” x 12”) and layer half the bread, half the spinach, half the mushrooms, and half the cheese. Repeat with the other half of all the ingredients, ending with the cheese. Slowly pour egg mixture all over the top. Cover with plastic wrap and refrigerate overnight, minimum. This allows the egg and milk to be fully absorbed into the bread. To bake, remove from fridge 20-30 minutes before baking. Remove the plastic wrap and cover the dish with foil. Bake for 30 to 40 minutes. Remove foil and continue baking until top is golden brown and slightly crisp.